The New Balance is a well-known brand for producing the ﻿﻿best walking shoes for ﻿﻿men. Comfort is of the essence for those men who are on the move for most time of the day. Nothing can make them at ease than having a nice comfortable pair of shoes which is specifically designed by keeping comfort in mind by the manufacturer. As a fact, a walking shoe should be very c﻿﻿omfor﻿﻿table, durable and easy to put on. These are some of the most important things that make a shoe perfect to be categorized as a walking shoe. Many people look for canvas shoes because of the various reasons like the softness and warmth they could get from the padded canvas and the easy to put on the structure. But if a shoe manufacturer, like that of New Balance, offers you shoes that are easy to wear on, look smart outside and is durable as well, then you should look into it to get the best you can. 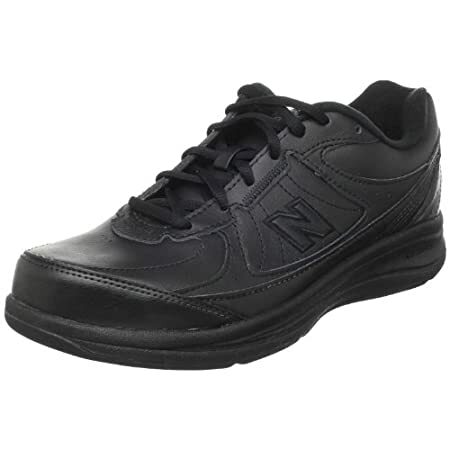 The New balance Men’s MW577 leather hook and loop walking shoe are one of the best examples of a comfortable and snug fit shoe you can bet on. 30% of the shoe content is imported while MW577 shoes are called ‘Assembled in the USA’. Capturing 25% of the USA athletic shoes market. 1300 workers are incorporated to get the job and the demand done for the shoes. The outer surface is made of leather which is available in seven different shades of black, brown and white. Each shoe is made with great care and has been given and excellent design that makes it perfectly fit for walking purpose. The shoe possesses two hook and loop straps equipped with strongly adhesive Velcro tape making it sure that it will adjust with your foot perfectly. There is also a logo stitched to the quarter panel giving it a customized look from the New Balance. The materials are synthetic leather giving it’s a soft and supple finish that can be cleaned and maintained very easily. You can use a soft cloth and the shoe spray to keep it as good as new. The inner are is covered with soft absorbent fabric that keeps the foot dry and cool to the extent that you never feel sweaty in your shoes. In addition to these, the shoe is padded with soft foam to keep the foot comfortable and stable. The outsole is of synthetic rubber giving the shoe a soft and durable surface that keeps the foot stable as well. The shape and design of the shoe are based on the years of research and the efforts to introduce a product that actually fits the size and serve the purpose of being a comfortable walking shoe. The shoe has a roomy interior with soft, padded sole and slightly raised heel that balances the heel and the forefoot are in a comfortable way. Due to the stable inner sole and well-designed outsole, the shoe enables the user to walk without having any trouble in balancing and walking. The rubber sole makes it easier to adjust with any kind of surface and keep the foot in place. Comfort is the unique selling point of the New Balance MW577 shoes. It is highly preferred by people having feet problems and also those who have diabetes and high blood pressure issues. Such comfortable shoes ensure that their feet are stress-free while they are on the move. The New Balance MW577 shoes appear to be quite stylish and contemporary. The manufacturer ensures that they provide the top quality comfortable shoes without compromising style. They are available in black color only which is the ultimate color choice of most of the trend and fashion conscious people. You should keep in mind that this is a synthetic leather shoe having an easy to clean surface, so you may not exp​​ect to get a pure leather shoe. The shoe provides a comfortable and easy platform for the user to stay easy and walk in a comfortable manner. Due to the sufficient room and enough padding, your foot will adjust as it moves and you will feel less fatigue and pressure on your foot muscles. The flexible sole and materials keep the foot easy and let it move as you walk and poses no extra pressure on it so that you don’t have to push and pull your feet as you walk. The rubber and the leather may not prove to be long lasting in case you use them frequently. In case you are overweight or have a heavy body that causes extra pressure on your feet and hence your shoes as well while walking, you may see wear and tear issues very soon. On the basis of all the features and qualities, the customers who have used the pair of shoes have rated them with 4.1 stars on average. Whereas they have been rated as 5 out of 5 stars by more than 50 percent of the users indicating that if you are in need of a quality shoe within a reasonable price, you can count on it for sure. All in all, this is a good choice for regular users having a medium body weight. It comes with an easy to wear structure and also is capable of providing comfort and flexibility during the walk to lower the level of fatigue and stress on your feet muscles.